Meet The Doctor | Wilmette, IL | Matthew V. Dolce, P.C. Dr. Dolce studied at University of Colorado at Boulder for his undergraduate degree. He received his DDS from the University of Illinois in 1993. In 1995, after a year of postgraduate residency in general dentistry at the University of Pittsburgh Medical Center, he opened his private practice in Evanston. In 2002 He moved the practice to its current location in Wilmette. Dr. Dolce lives with his family in Wilmette. 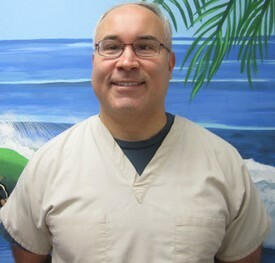 Dr. Dolce enjoys surfing on Lake Michigan in Evanston and Winnetka. He coaches his daughter's soccer team and is an amateur runner competing in local 5K races and has completed two marathons. Dr. Dolce has served as President of the Evanston Association of Dentists. He has represented the North Suburban Branch of the Chicago Dental Society on various committees. He is a member of the ADA, the Chicago Dental Society, the Illinois State Dental Society and the Evanston Area Association of Dentists. In 2006 he was recognized for his many years of sponsoring and presenting dental health awareness programs to the community, and was awarded first place by the Illinois State Dental Society for National Children's Dental Health Month.